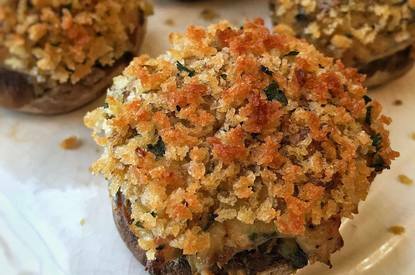 As an appetizer or side dish, these stuffed mushrooms are a hit. They’re the most requested at my parties. So no wonder they’re always the first to disappear at them, too. Tender, earthy mushrooms are stuffed with a rich, cheesy, Bacon mixture and topped with crisp, golden, panko crumbs. Who wouldn’t love these? I prefer using small to medium-size mushrooms for appetizers, and bigger ones for a side dish. The filling is fun to tinker with as you can add some chopped jalapeños or Tabasco for heat. These can be made a day in advance, just wrap them and keep them refrigerated until it’s time to pop them in the oven.